Inder Loves Folk Art: Golden Gate Singing and KCWC Days 1 & 2. Well, the 8th Annual Golden Gate Singing on Sunday was just wonderful and uplifting. The weather was perfect (not too hot, not too cold), the views of the San Francisco Bay from our location on Potrero Hill were just sparkling, the food was delicious and abundant, the crowd was just the right size, and the music was loud and invigorating. For my part, I think I hit just the right balance of making myself useful and enjoying the music. For those of you who have never heard music sung from the Sacred Harp, here is a sample, borrowed from the awesome blog of friend and fellow shape note singer, Dan Harper. Technically, I am singing in this video, but you can't see me because I am behind some taller folks. You'll just have to take my word for it that my voice is present. It was a really lovely day. As predicted, however, this wonderful day of singing followed by busy days at work left me a bit beat and KCWC got off to a slow start this time around. 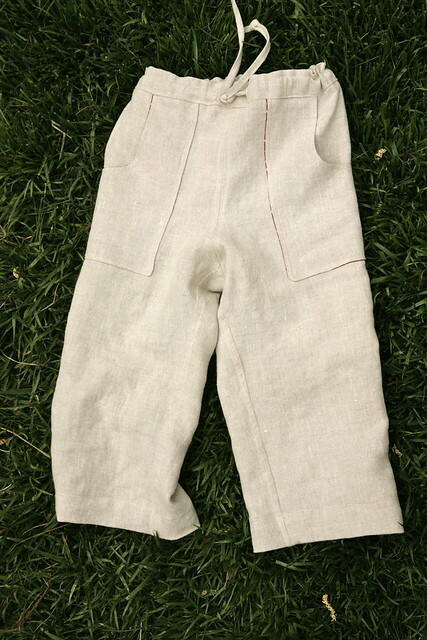 I cut out Sandbox Pants in a light, stone-colored linen for Joe on Saturday, but barely managed to sew the pockets to their pocket linings on Monday night before collapsing in a tired heap. I might have achieved an hour of sewing, if you count moving slowly and dilly-dallying. I did remember to take a photo of the linings so that you can see my fabric selections, though. This red star fabric was a gift from my lovely friend Christine, who blogs at OakRose Mama. She sent me some smaller scraps, which worked out perfectly for pocket linings on these pants. The linen I used has been in my stash for years. One of my goals for this KCWC was not only to use up stash fabrics (easy enough, with my fabric buying habits), but to use some of the pieces I've been holding onto for a really long time, for reasons I've long since forgotten. I have about four yards of this lovely natural colored linen, which I bought for curtains about ten years ago ... I hate sewing curtains (also, beige curtains? so boring! what was I thinking? ), so it's no wonder this fabric has sat on my shelves untouched for a decade. It was high time it got used for something. An aside: I have a theory that if a fabric sits in my stash long enough for me to forget how much it cost at the time I bought it, it becomes essentially free, allowing me to feel very thrifty and virtuous sewing it up. Feel free to apply this theory to your own sewing life. But anyway, back to KCWC. 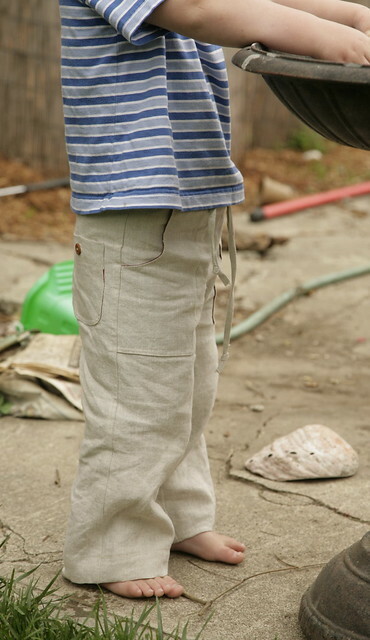 Monday didn't go particularly well, sewing-wise, but I made up for it last night, when I finished up the Sandbox Pants. This was especially impressive as this linen turned out to be insanely prone to unravel at the seams, and after watching a couple of seams disintegrate before my eyes, it was clear that I needed to flat-fell or otherwise enclose every seam in these pants if I wanted them to survive the washing machine. So that's just what I did. With the tedious but satisfying result that the inside of these pants is just as neat and pretty as the outside of the pants (and my fingertips are still singed from trying to fold and then iron tiny little half inch seam allowances down - perhaps I should consider trying a flat-fell foot one of these days). This morning, I was able to take some photos outside just as it started to drizzle. I love the patch pockets and details on these pants. The drawstring is a bit of a distraction for Joe so I may make it purely "ornamental" or eliminate it entirely in future iterations of these pants, but I like the idea of it. Then I tried the pants on Joe, and they fit really well! If I make these pants again, I will shorten the rise a bit, as these are a bit long in the crotch area for Joe. For Joe, the Sketchbook Shorts remain the gold standard in fit, and I've decided I should just alter all future pants patterns using those as a guide. 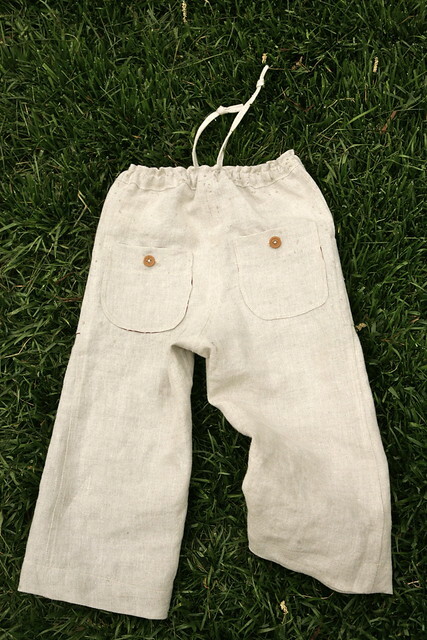 In this lightweight linen, however, even the baggy seat adds to the "beachy" vibe of the pants. I expect Joe will get a lot of wear out of these this summer. The hems are really deep, so I could easily make these longer, which is good because this kid is growing like bamboo these days. I wanted to get some better full-length shots of Joe wearing the pants, but Joe was in a bit of a mood this morning, as you can see here. That's pretty much how I feel early in the morning before I've had my coffee, too, so I can't blame him. I wouldn't want someone to take my photo before 9 a.m. either. At least he didn't complain about putting on his new pants (instead, he freaked out over his shirt). That's something. My next project, the Flashback Skinny Tee, should go together really quickly in comparison to these pants, so stay tuned for more KCWC! Wow that singing is so moving, hearing it in person must be something else. Glad your day was lovely. and hey I thought that star fabric looked familiar :) Glad its getting put to good use! Now I know Joe is growing but those pants really make him look tall! Either that or they just look so sophisticated on him while still keeping that beachy feel (which I love, growing up near the beach yknow). Also I like your theory about the free fabric...the stash is getting out of control. Joe is really growing - especially in height! 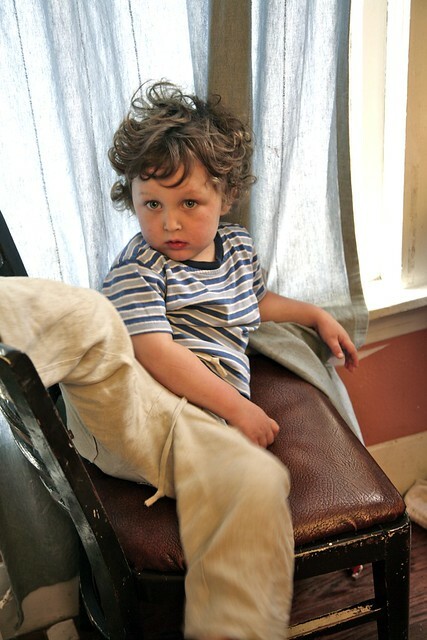 That said, when I get down at his level for these portraits, they tend to make him appear taller than he really is. Love these in linen, and so glad this pair fits! I'm using some balck drill for the pants I'm making - which was sent to me in a swap, so that definitely makes them free, huh? I LOVE these in linen, they are gorg! 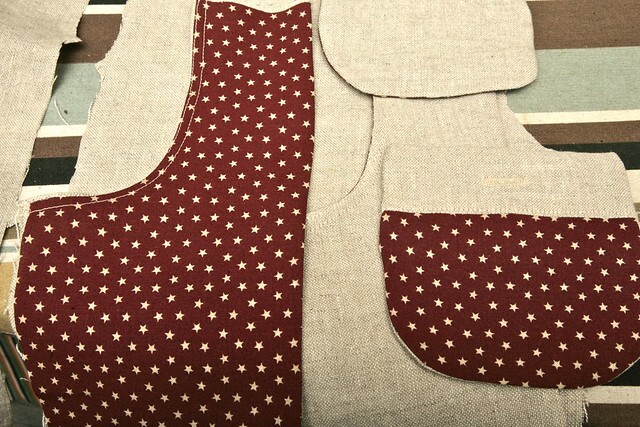 And very cute pockets on the back. P.S I'm going to adopt your sewing theory about old fabric becoming 'free'. It's a goodie! Thank you, and happy to oblige. Hehe. These are absolutely lovely, they could be dressed up as smart or casual and they look like a great fit. I only started sewing a year ago so I don't have any 'free' fabric yet, how long do I have to wait? Ha! Great minds really DO think alike! I'm happy to see your linen version. I have some linen and considered using it for a pair... literally picked it up and then put it down again afraid it wasn't the best choice. But I like yours and so may have to go with a linen pair after all. You'll love the Flashback Tee!